Remember we got a new sofa? Turns out it's not so much ours as Au, Target and Guido's! T-man and me sit wherever we can get in some bum space. We're writing another book so we're a bit out of it at the moment but we should be round to visit efurryone in the next few days. Meow! At least they have left you a little bit of room. Happy sofa sitting and happy writing! Thanks for letting us know you are all okay! oh my goodness kitty, you do know how to stake out your niche. scoot over for us. That couch sure looks comfy! Good luck with your book! Cats and a BLACK sofa! Wow! Have fun writing. Hi Au, your peeps are complaining. There's plenty of room on the couch for at least 6 humans and about 30 more cats. And for me too. That is a great sofa, but yeah, not much room for the humans. Thank goodness you didn't have to stand up all evening! We like how everyone is uniformly spaced out. LOL. That is a nice couch. I'm so glad mommy bought a new sofa for you guys! You need a soft place to lounge around. love how they have themselves spaced there...too funny! Oh yeah, that is THEIR couch. Not yours. MOL! Good colour combination and accessorizing. Cats are always very artistic and have good taste. Now your sofa will be nicely decorated with nice orange fur. Ha ha! Isn't that what a cozy couch looks like? If it was our house, they'd take the best spots and refuse to move if you want to sit where they are. They rather be sat on than move an inch. An orange boy in EVERY corner! ...thank COD I there is only ONE Waffles Too in my house! Your sofa looks much better with the cats then without ! gives a cosy look; Btw, I like your new sofa, lol ! Their orange coats look so pretty against the color of the couch. I'm sure that all three feel that the new couch was a gift for just them. Oh good boys for taking over that sofa.You are looking good. Have a great day. Hey Guido, Hey Au, Hey Target, Jet here. Hi Miss Ellen. We really don't get the issue... who else should rest comfortably on the lovely new furniture? Hiya, just wanted to come and comment over here in case you didn't get the reply to your comment on my blog. Wow! Everyone has a place to snooze. Where should I snooze? Who wants me to snooze next to them while I'm here?! Wow, that is a wonderful couch and the orange boys sure do look good on it! 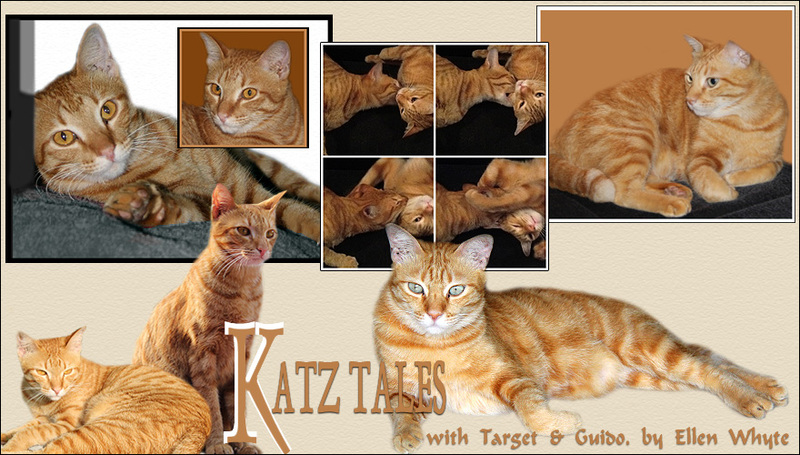 Target Speaks: We Tabby Cats Get Awards!